As regular readers of this blog will know I am lucky enough to have a very dedicated girlfriend who is exceptionally supportive of my hobby! In fact not only does she support me in my miniature endeavours...she also actively participates in them, regularly taking to the field opposite me and utilising one of my secondary armies on the tabletop! Well she has recently decided to up her game (excuse the pun) a bit and actually build her own force of Space Marines to lead to war, and being a loving boyfriend I have sworn to help her in this sacred mission...consider it my Oath of Moment! Anyway before we could get started she needed to choose which particular Astartes faction that she wanted to command and this was fairly easy to be honest. For the last year she has been reading her way through the Horus Heresy series of novels and has really become focused on the Vlyka Fenryka of the Space Wolves Legion, their sheer brutality and power appealing to her. This is an ideal option as with a bit of careful army planning a force of Space Wolves can be equally played in both the Horus Heresy and the contemporary 2nd Edition 40k settings. With the faction decided we then sat down and worked out what she wanted from her force and drafted a quick 'army list' the components of which we then went out and sourced from various suppliers. She was very clear that she wanted her marines to be coloured in the storm grey battle plate of the legion as opposed to the baby blue grey of the later chapter, with that in mind I put together some test models for me to work out a colour scheme ...and these led to the production and completion of the pictured commander model (more on him later). As we wanted her force to be playable in 30k as well as 40k I also ensured that I sourced additional contemporary components (Mk II, III, IV, V and VI armour) for her models! 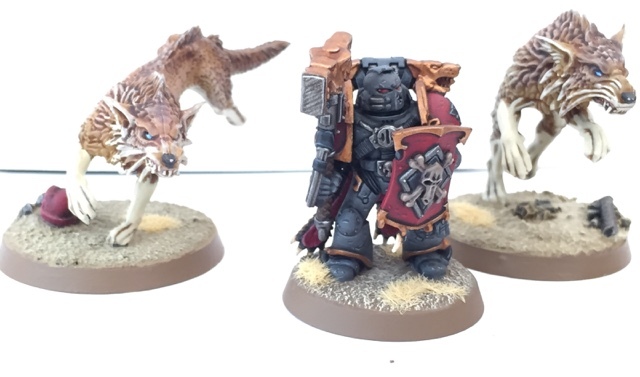 One of the appealing things about a Space Wolves army is ...well...wolves!! 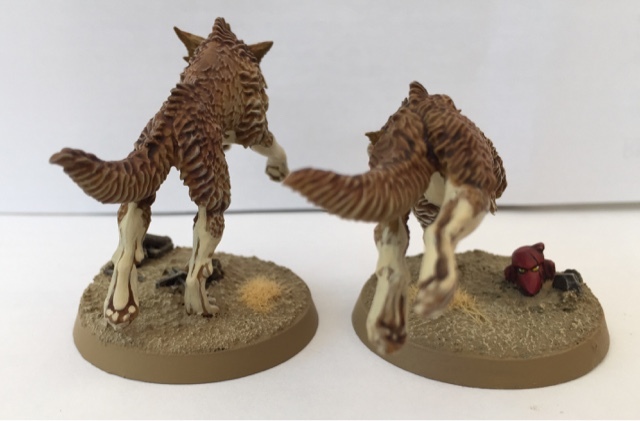 So my girlfriend also bought herself a box of GW's Fenrisian Wolves to accompany her warriors into battle. With the models and materials purchased and a paint scheme sorted we then arranged a period of joint leave from our jobs and settled down for a session of intense painting where I tried to teach her as much as I know about painting in manageable easy to digest chunks! It is pretty hard to tell who painted which model! The results were amazing! As a former GW staff member and longtime hobbyist I have taught a lot of people to paint over the years but none have taken to it as naturally as her. She was a great student and really took on board everything I was saying which always helps! 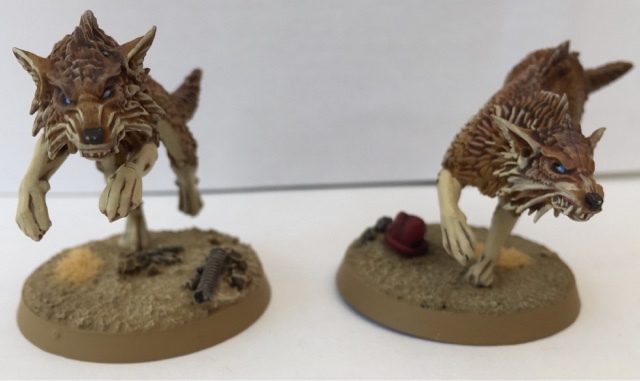 The first model she wanted to paint was a Fenrisian Wolf and so we broke them out of the box and assembled two for painting. Now I know from my days of instruction in the Army that it is best to teach people by showing them what you want and then getting them to emulate it and so in light of this we followed a simple format...we painted one wolf each, with my girlfriend following my lead on the application of the assorted bases, layers and washes. As you can see from the above image the results were very impressive and it is practically impossible to distinguish her finished wolf from my own! I need to point out that this is the first ever model that she has painted and assembled in her life...wow, just wow! Notice the red space marine helmet littered on the base, likely torn from the body of an unlucky Thousand Son by the giant wolf! In case you're wondering which model she painted...well, the model with the Space Marine helmet on the base is her one...and yes, she even painted the helmet herself too! Overall she did really well and produced some excellent results over the few days we spent on the models and I am confident that she is going to be a very good painter. Now the Wolves obviously needed a master to command them and luckily enough I preserved one of the test models that I painted as I felt it looked good enough to lead the Sons of Russ to war. 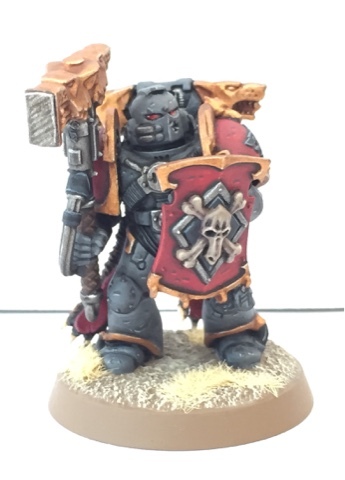 As previously discussed this Commander was painted in the storm grey armour of the original legion which I personally feel is a much more rugged, military shade than the current pale blue of the modern models. 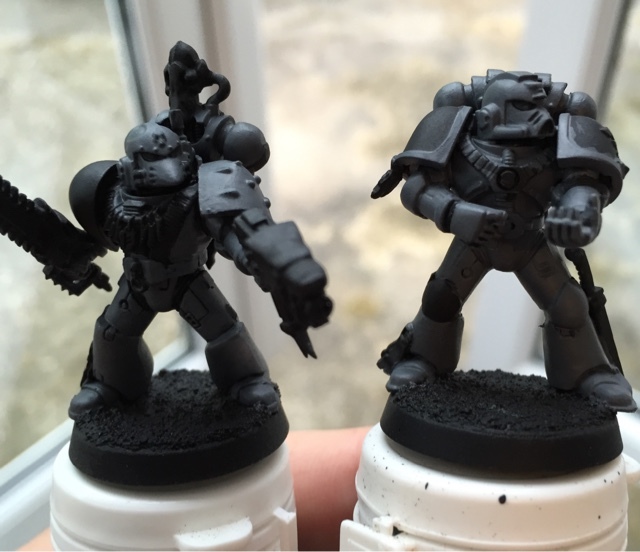 Also you can see that the components of his armour have been specially sourced to reflect the earlier Marks of Space Marine plate used by the Legions during the Great Crusade and subsequently during the dark days of the Heresy. Whilst he has two pet wolves accompanying him to war it seems he is not adverse to also turning them into fashion accessories. 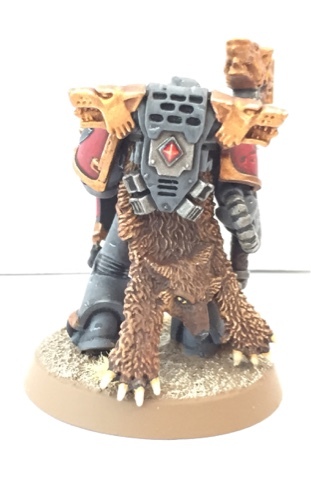 I have also added various pieces from GW's Space Wolf miniatures range to the model in order to give it a greater degree of individuality whilst thematically tying it to its parent legion/chapter. This includes the wolf pelt on its pack and the Thunder Hammer and Storm (Boarding) Shield weapon combination. As this model was likely to be the army's warlord I also gave his armour a degree of weathering and battle damage in order to indicate a veteran warrior who is currently on campaign. I am happy with the overall look of this model and feel he cuts an imposing figure, especially when accompanied by his two pet wolves. What next then...well with a commander and two wolves done clearly the next thing this force needs is some basic soldiers and what better troops choice is there than a Legion Tactical Squad/Grey Hunter Pack... and so my girlfriend and I have each basecoated a boltgun wielding tactical marine which we will be painting together in the very near future! I shall of course let you know how this project progresses! Two more troops on their way to defend the Imperium! For Russ and the Allfather!! Cheers mate, I'm looking forward to seeing some more of her work as well!! Wow - congrats to both teacher and student - impressive results! Definitely agreed that the Storm grey is the better choice. Thanks dude. I have to say she was a joy to teach! Yep I'm a big fan of the storm grey, it's far more menacing than baby blue! It's true! She is the Darth Vader to my Obi Wan!! She has taken to all elements of the hobby with a natural talent!! I am indeed very lucky! 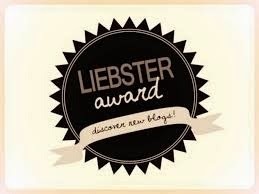 Return from the wilderness...and interesting developments! More Normans.... Or maybe Frostgrave Henchmen types!